Not only do bees eat honey they produce in the hive, they love it! Honey is their main food source, so they store and seal it carefully in the hexagonal cells of the honeycomb of the hive for consuming. Bees eat honey in both times of plenty and times of scarcity. A foraging bee weighs 100mg and can transport a 70mg load of nectar, the precursor to honey, in flight. The flower’s nectar is made up of 80% water. Bees transform it into honey by a combination of transferring it back and forth between each other (which adds enzymes to break down the sugars), fanning it with their wings and keeping the hive at a warm temperature. Evaporation of moisture from the stored nectar produces the honey that contains no more than 17% water. Once the honey’s moisture content is at the desired level, the bees then cap off the cell with a layer of beeswax. 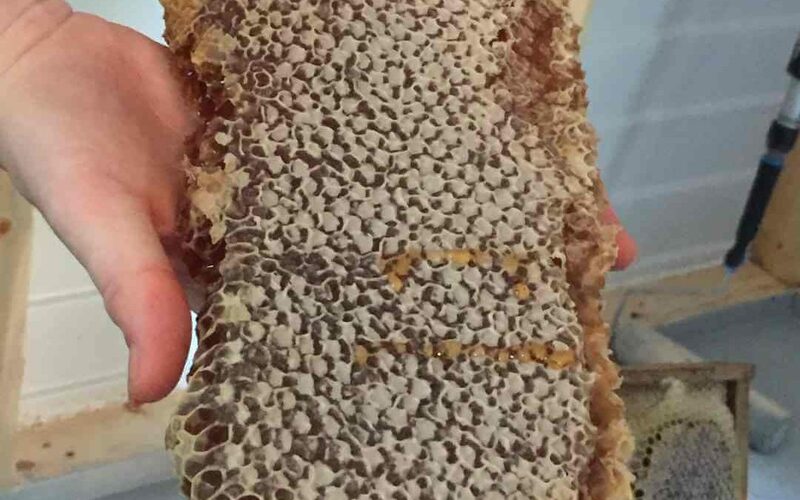 Capped honey does not ferment, and is the sole food for adult bees. Easily assimilated, it provides the energy for flying and also holds in the heat that allows for the colony’s survival in winter. Bees make more honey than they will ever consume. That is why beekeepers can ethically remove honey from the hive. Beekeepers also supplement the bees with various sugar syrups to keep them happy, healthy, and full of energy.